If you do not see what you want please call as we are adding new items every day. AIRTEC Seat Leon Mk1 Cupra R Upgraded Front Mount Intercooler FMIC. AIRTEC Seat Leon Mk1 Cupra-R Upgraded Front Mount Intercooler. An ideal uprade for all Cupra R's with remapped Ecu, Perfect for Fast Road and Track use, As fitted to AIRTEC demo car. & more than capable&###xA0;of doing the same if not better job than more expensive Intercooler kits, we take&###xA0;a huge&###xA0;amount of pride in making sure our kits are finished to an Extremely high standard. AIRTEC&###xA0;Front mount&###xA0;Intercooler kit Includes these parts & Features &##xA0. 1 x Huge 60mm core Intercooler with flowed cast end tanks, this means less welding and a stronger Intercooler. High quality 4/5ply silicon hose's with alloy joiners & stainless Jubilee clips. Powder coated upper bonnet catch support brackets'originals are removed to give extra space for fitting intercooler. Retains original crash bar'un-cut. Retains original fog lights without any modification. Fitting Instructions and all required fixings. Proven Power Increase's for Fast Road & Track. Available in Satin Black or Polished Alloy. Fitting will take 2-3 hours depending on mechanical skill. Amd Rolling Road tested results - Stage 1 remap'Higher stages of tune will see even bigger gains. Standard - Temps&###xA0;Into Intercooler 128 degrees & Out of Intercooler 49 degrees, 12 bhp gain in mid range and standard Intercooler kept losing power. AIRTEC Intercooler - Temps Into Intercooler 126 degrees & Out of Intercooler&###xA0;23 degrees. Intercooler available in standard silver or stealth black finish. Hose colour available in Red / Blue / Black &###xA0;/ Yellow. Logo colour available in &###xA0;No logo / Red / Black / White / Yellow. We specifically disclaim any implied warranties of title, merchantability, fitness for a particular purpose and non-infringement. Customers should satisfy themselves that any item choice made is suitable for their intended purpose or use. We cannot be held responsible if the product is not suitable for use outside the UK. Therefore we reserve the right that if you have ordered the item incorrectly or no longer want the item we will at our discretion minus the following amounts (based on normal mainland UK addresses, non mainland and non UK maybe more) : Items sent by Post - &###xA3;2.95 Items sent by Recorded Post - &###xA3;4.95 Items sent by courier 1kg to 10kg - &###xA3;6.95 Items sent by courier OVER 10kg - &###xA3;9.95. This listing is currently undergoing maintenance, we apologise for any inconvenience caused. 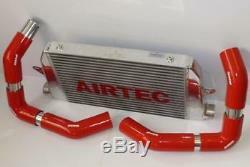 The item "AIRTEC Seat Leon Mk1 Cupra R Upgraded Front Mount Intercooler FMIC" is in sale since Monday, July 28, 2014. This item is in the category "Vehicle Parts & Accessories\Car Parts\Turbos & Superchargers\Intercoolers & Parts". The seller is "rudiemods" and is located in SOUTH WOODHAM FERRERS. This item can be shipped to United Kingdom, United States, Japan, Canada, Ireland, Australia, Germany, France, Greece, Italy, Spain, Austria, Belgium, Bulgaria, Croatia, Cyprus, Czech republic, Denmark, Estonia, Finland, Hungary, Latvia, Lithuania, Luxembourg, Malta, Netherlands, Poland, Portugal, Romania, Slovakia, Slovenia, Sweden, Brazil, New Zealand, Israel, Hong Kong, Norway, Indonesia, Malaysia, Mexico, Singapore, South Korea, Switzerland, Taiwan, Thailand, Bangladesh, Bermuda, Bolivia, Barbados, Brunei darussalam, Cayman islands, Ecuador, Egypt, Guernsey, Gibraltar, Guadeloupe, French guiana, Iceland, Jersey, Jordan, Cambodia, Liechtenstein, Sri lanka, Macao, Monaco, Maldives, Martinique, Nicaragua, Oman, Pakistan, Peru, Paraguay, Reunion, Chile.